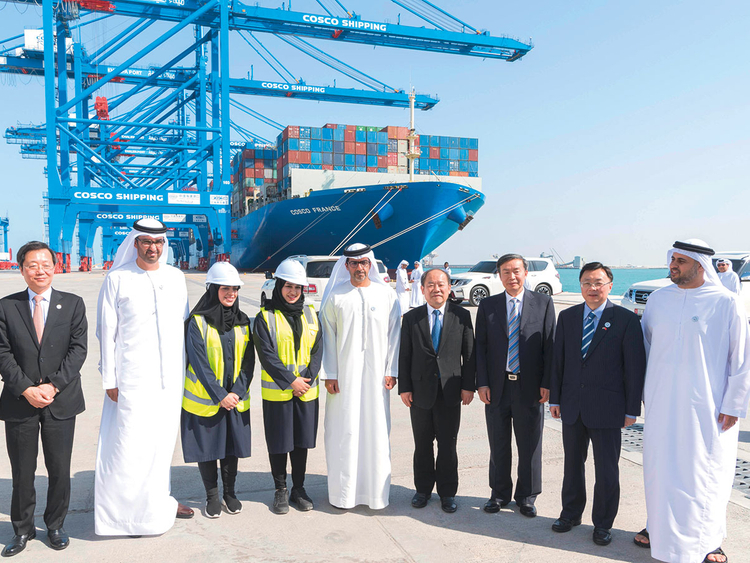 Abu Dhabi: Abu Dhabi Ports on Monday inaugurated the new Cosco Shipping Ports (CSP) container terminal at Khalifa Port that is expected to boost trade with China and support China’s ambitious One Belt One Road initiative. The new terminal, which includes the largest container freight station in the Middle East, is the result of a 35-year agreement between Abu Dhabi Ports and Cosco Shipping Ports Ltd, a subsidiary of Cosco Shipping Corporation Limited of China. The new container terminal has a capacity of 2.5 million TEUs (twenty-foot equivalent units) and can accommodate mega vessels carrying in excess of 20,000 TEUs. Cosco has spent Dh1.1 billion on construction and machinery at the terminal, according to a statement from Abu Dhabi Ports and Cosco Shipping Ports Limited. The terminal was inaugurated at a ceremony at Khalifa Port by Shaikh Hamed Bin Zayed Al Nahyan, Chairman of Abu Dhabi Crown Prince Court. The event was also attended by Shaikh Theyab Bin Mohammad Bin Zayed Al Nahyan, Chairman of the Department of Transport, Dr Sultan Ahmad Al Jaber, UAE Minister of State and Chairman of Abu Dhabi Ports Company and Jianzhong, Deputy Minister of Ministry of Transport of China, among others. In a statement, Shaikh Hamed emphasised the cordial and productive relations that have developed between the UAE and China over the past 34 years. Dr Al Jaber said the opening of the new terminal further strengthens relationship between the two. China is the UAE’s largest non-oil trade partner. In 2017, bilateral trade between the two countries increased by 15 per cent to more than $53 billion (Dh195 billion), representing 14.7 per cent of the UAE’s total foreign trade.